A SMALL group of Malaysian supporters shouted themselves hoarse, rooting for kumite exponent Jamaliah Jamaludin (pic) to win a third gold medal for Malaysia in karate competitions. But the Asian Games debutant met her match in the final bout of the women’s above 68kg competition against Jordan’s Manar Shath at the Guangdong Gymnasium yesterday. The spunky Shath demonstrated exquisite timing, repeatedly inviting Jamaliah to attack before scoring points with well-executed punches to the chest to prevail 5-2. The Jordanian was 5-0 up before Jamaliah could respond. Jamaliah had ensured at least a silver medal for Malaysia on the second day of competition after edging Gaukhar Chaikusova of Kazakhstan 1-0 in the semi-finals. She enjoyed a first-round bye and advanced to the last four with a 1-0 win over Filipino Paula Cristina Carion. Jamaliah thought that she had a good chance to strike gold after favourite Tang Lingling of China was beaten 2-5 by Shath. beat her again,” said the 26-year-old Jamaliah, who was the runner-up in the Asian tournament in China last year. “But the Jordan fighter won and I had never fought against her. And she was very good in counter-attacking today. The silver from Jamaliah was the only medal-winning effort for Malaysia on the second day of karate competitions as G. Vathana and Lim Yoke Wai were eliminated early in the women’s below 55kg and men’s below 67kg events respectively. Vathana failed in her bid to earn a first Asian Games medal when she lost on a head referee’s decision in the first-round bout against Marna Pabillore of the Philippines. Yoke Wai failed to repeat a silver medal performance at the previous Games in Doha. He was eliminated by 2008 world champion Shinji Nagaki in the first round. 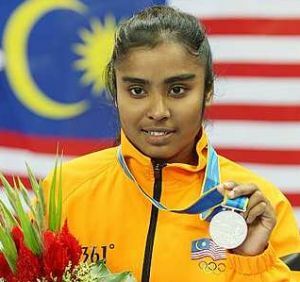 Hopes will now be on Laos SEA Games gold medallists G. Yamini and Mohd Hatta Mahamut to bring Malaysian karate to a new high when they compete in the women’s below 61kg and men’s below 84kg competitions today. Malaysia already have two gold medals to show from Ku Jin Keat (men’s kata) and R. Puvaneswaran (men’s kumite below 55kg).